Solubility of new chemical entity wasa major concern for formulation. Desired concentration of drugs was achieved through solubility in systemic circulation. A higher doseis required by feebly soluble drugs to reach therapeutic plasma concentration, So to enhance the solubility various methodologies are incorporated in which complexation is explained in detail. 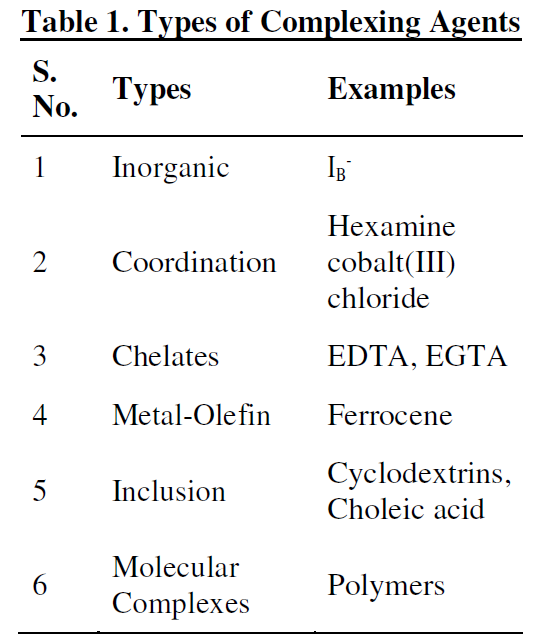 Types of complexation along with complexation agents are explained in the review. Various approaches used for making inclusion complexes are elucidated and some methods are also briefed so that can complexation efficiency can be enhanced. The drug should present in aqueous form at the site of absorption to get absorbed. Number of excipients was used to formulate a difficult molecule of a lipophilic drug such as cyclodextrin, carbohydrate, dendrimers and many more so that the solubility can be improved.